The clip has been viewed more than two million times on YouTube, has been the talk of offices around the country and has even spawned its own Twitter hashtag. 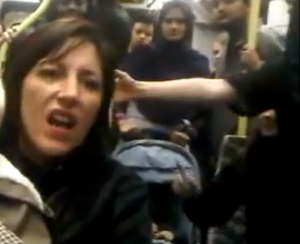 Yes, we’re talking about the infamous ‘tram lady’ – the woman filmed shouting her racial opinions at passengers on a south London tram, somewhere between Wimbledon and Croydon. According to British Transport Police, a 34-year-old woman has been arrested (and now charged) on suspicion of a racially aggravated offence. In the clip, taken on a mobile phone, the woman can be seen accusing passengers of ‘not being British,’ while she balances a toddler on her knee. She goes on to demand that they ‘go home to where they came from,’ swearing repeatedly and becoming increasingly agitated. The video has caused a storm of protest online. A spokesman for the British Transport police said, ‘The video posted on YouTube and Twitter has been brought to our attention and our officers have launched an investigation. We will not tolerate racism in any form on the rail network.’ The authorities are now asking witnesses who were on the Croydon to Wimbledon Tramlink route to come forward with any information that could aid the investigation.